The official designation for this planetary nebula is PK205+14.1. It is also listed as Abell 21 and Sharpless 274. It is a very large PN in Gemini perhaps 10 arcmin in diameter. The brighter portion pointing to the SE gives it a crescent moon appearance, but closer inspection shows fainter regions toward the NW. Thus, it probaby has an ellipsoidal shape. North is to the lower left. This image is comprised of 6 nm H-a mapped to red and 3 nm OIII mapped to equal mixtures of green and blue to enhance contrast and bring out the incredible structure within the PN. 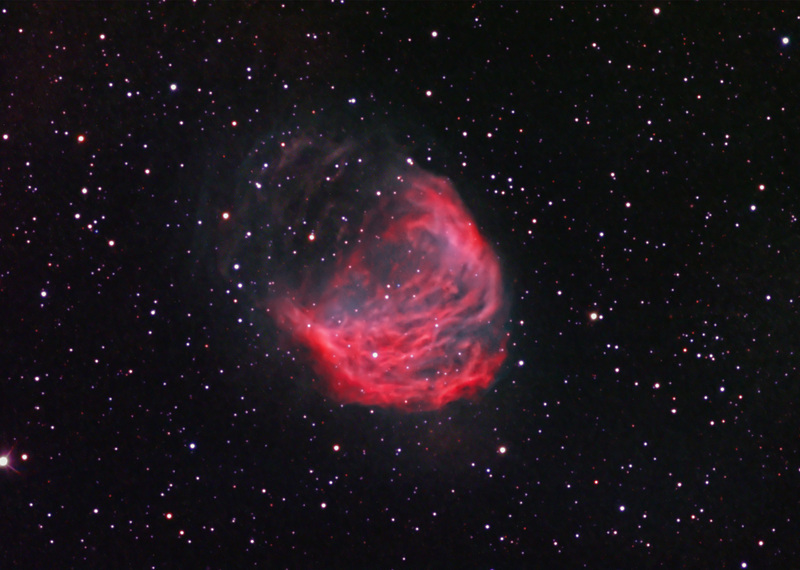 Star colors were blended in from G2V-balanced RGB data.